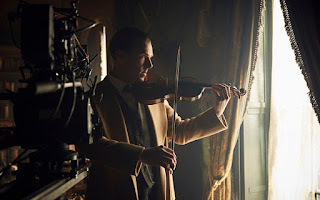 Well, it's been a couple of weeks now and I think you've all probably seen it if you're going to, so the time has come to talk about and dissect this newest offering of Sherlock. Mostly what I really want to discuss, though, is how such good intentions could have gone so clearly wrong? Not to say that everything in "The Abominable Bride" is awful, but more that there were so many elements that seemed intentionally designed to redress some of fans' legitimate grievances with the show, and none of them seem to have had the intended effect. Or, to put it more clearly, how did Moffat and Gatiss try to write a whole episode about how women are awesome and only end up offending everyone even more? It's honestly just kind of impressive. Before we get to that, though, we need to talk about what the episode was actually about, because that was not entirely clear from the outset. Ostensibly this episode was a sort of alternate version of events. Instead of the accepted Sherlock world where John and Sherlock are both modern men living in the twenty-first century, this Sherlock presented a little thought experiment on how things would go down if they were meeting in Victorian London like in the actual stories. I'm not super sure why the show chose to do this - it seems to me like they removed the most interesting thing about the series in the first place - but whatever. They did it. 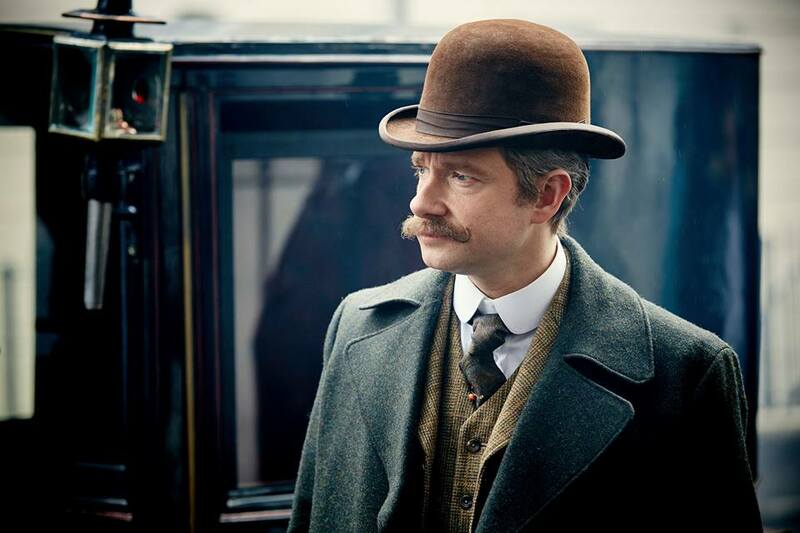 After glancing over this Sherlock and this John's meeting, the story jumps several years ahead and begins to relate a particularly vexing case: that of the "abominable bride". The case is your basic classic Arthur Conan Doyle, actually, and I really liked the setup. Sherlock is called in to investigate a case of Emelia Ricoletti (Natasha O'Keeffe), a woman dressed in her wedding gown shooting up a street then killing herself, only to later seemingly rise from the dead and shoot her husband before returning to the morgue. Sherlock isn't overly interested in the case, furiously insisting that ghosts are stupid and making fun of John and Lestrade for being creeped out. 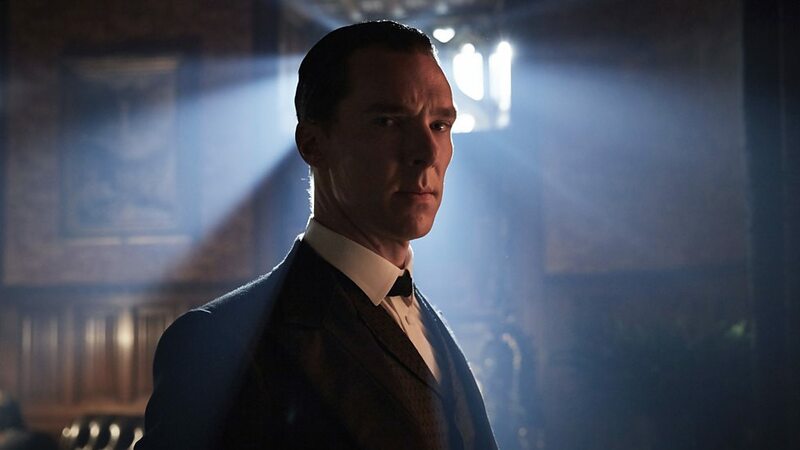 Then we jump forward a little bit in time and see that the rumor of the "abominable bride" has spread. There are more murders now, all of them done in the same style and all with the hallmarks of the bride. Sherlock writes them off as copycat murders, a quick and easy way to cash in on a gruesome crime, but when Mycroft asks him to look into one particular case, he takes notice. This case is peculiar, to say the least. Sir Eustace Carmichael (Tim McInnery) is a noble of good standing who has recently received what can only be a death threat. Said threat, five orange pips in an otherwise message-less envelope, is one that he immediately recognized as terrifying but now refuses to acknowledge. Yet, according to his wife, Lady Carmichael (Catherine McCormack), Eustace wakes up every morning terrified that the abominable bride is out there in their unnecessarily creepy hedge maze, waiting to kill him. It wasn't until Lady Carmichael followed her husband outside one night that she got genuinely concerned though - it seems that in the hedge maze Lady Carmichael also saw the bride, and that's even more alarming. So Sherlock and John are on the case while Mrs. Hudson and Mary are left behind to make dinner or do whatever it is they do. Actually, this whole episode makes it clear that neither Sherlock nor John know or care particularly what it is that women do when they're not around, as evidenced by a very funny but incredibly anachronistic conversation John has with his maid. His maid, who is great and played by Stephanie Hyam, points out that John not only doesn't know where Mary is, he doesn't know what she's been doing for months because he just takes her for granted. Too right. 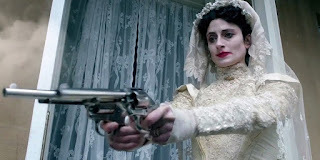 Anyway, Sherlock and John set up a sting to catch the bride in her act of murdering Sir Eustace and to prove that she's not a ghost, but they fail. Sir Eustace dies and John is even more convinced than before that the bride is a "spirit from beyond". This is where the plot goes a bit wonky. Suddenly, out of left field, Moriarty starts popping up, despite him definitely being dead. In this fiction, his struggle with Holmes was the classic battle at Reichenbach Falls in Switzerland*, but make no mistake: Moriarty is totally supposed to be dead. Only he's not. As the narrative goes screwy, it becomes increasingly clear that the little anachronisms and weirdnesses have not been accidents or bad research by the BBC, but intentional clues as to what the real plot of the episode is: namely, none of this is real. This isn't even an alternate reality version of events, the plot of this episode is very literally taking place inside of Sherlock's head. 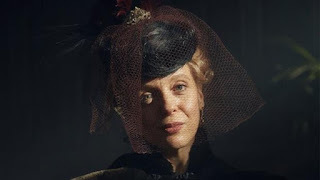 Yes, it seems that instead of giving us a one-shot episode, "The Abominable Bride" is actually a sort of bridge or interlude to take us from the abrupt ending of season three to the actual start of season four. Sherlock has created this Victorian world and imagined himself into it so that he could figure out the solution to an impossible puzzle: if Moriarty shot himself in the head and Sherlock watched him die, how could he still be alive? 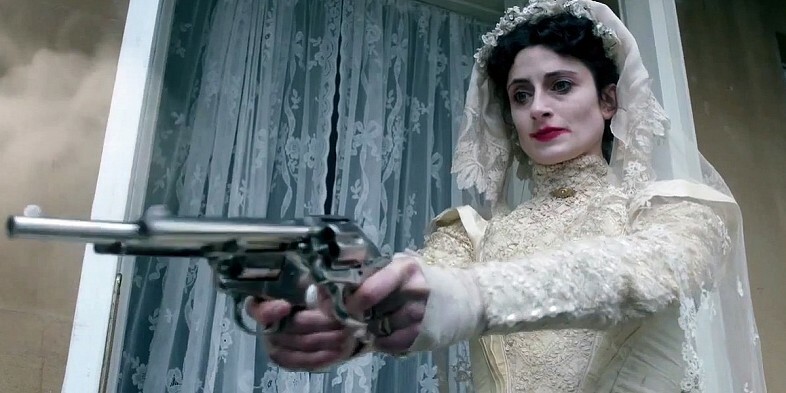 The Emilia Ricoletti stuff and the "abominable bride" is based on the only other historical case Sherlock could find where someone supposedly shot themself in the head then came back after. Having taken quite a lot of drugs before even getting on the plane in the season three finale, Sherlock retreats into his mind palace to try to solve a century-old cold case and thus explain how Moriarty is back. It's a clever conceit, but like most clever conceits, it actually only serves to take the wind out of our sails. Now that we know the abominable bride case isn't real, the stakes no longer matter. We stop caring who actually killed Sir Eustace and if Emilia Ricoletti is still alive because it's not real. I mean, it was never real, because it's a fictional show, but now it's a fiction inside the fiction, which is somehow worse. Out in the realer world, Sherlock battles with John and Mary and Mycroft for his right to go back into his brain and finish the case. They're all quite worried about him - mostly because of the drugs - but he shrugs them off and fades in and out of consciousness. At times, even when he's in the "real world" he's actually still asleep. The answer, when it comes, is both clever and disappointing. It comes by way of Mary, who it seems has been off doing secret stuff for Mycroft this whole time and actually solved the case while the boys were bumming around. This is especially interesting considering that this is taking place in Sherlock's head and therefore says a lot about how he views Mary. At any rate, Mary leads them right to an abandoned church filled with hooded figures. Spooky! Only it turns out that the hooded figures and the solution to the puzzle are a little mundane. It's women, that's the solution. A secret society of nice Englishwomen devoted to helping each other out and killing abusive husbands and things like that. The details of how Emilia Ricoletti "rose from the dead" are interesting**, but overall the scene comes off as mildly condescending and a bit of a let down. The women in the crowd aren't just Victorian women who've had it up to here, but also women from Sherlock's real life, like Molly Hooper and Janine. The implication here is that Sherlock is, through this case, becoming aware of the importance of women in his life and in society. Since this is Sherlock's brain working through his issues, we can surmise that some of his issues have to do with how he treats women. We can also read this as an acknowledgment from Steven Moffat and Mark Gatiss of the common criticism that Sherlock isn't a particularly woman-friendly show. The female characters have very little to do and frequently have their agency removed by the plot, or else they are lovesick idiots who deserve our pity. This, then, would be their way of saying, "Hey, we heard what you said, so here's a story about really awesome female characters that can show how much we understand and respect women." Sadly, that is not how it comes across. But we'll get to that in a minute. The actual conclusion of the story has Sherlock, in his mind, fighting with Moriarty at Reichenbach Falls once more. Sherlock knows he's in a dream and so does Moriarty, but they're basically fighting over whether or not Moriarty will continue to be a shade who haunts Sherlock's mind, or if it's time for him to be really dead. Then Sherlock's perception of John shows up and saves him and everything is all right and dandy. Sherlock wakes up in the real world assured that Moriarty is totally dead and this is just someone else acting from beyond the grave, and then they all storm off to have adventures we won't get to see until 2017. Now here's a confession: I wasn't actually going to watch this episode, let alone review it. I ended up seeing it simply because my parents were watching it and I didn't feel like going upstairs. While I remember the heady days when Sherlock first came out and I was all over it, even going so far as to write articles about how "progressive" it was, I'm not so into this show anymore. The more of it I see, the more it feels like a very narrow world. 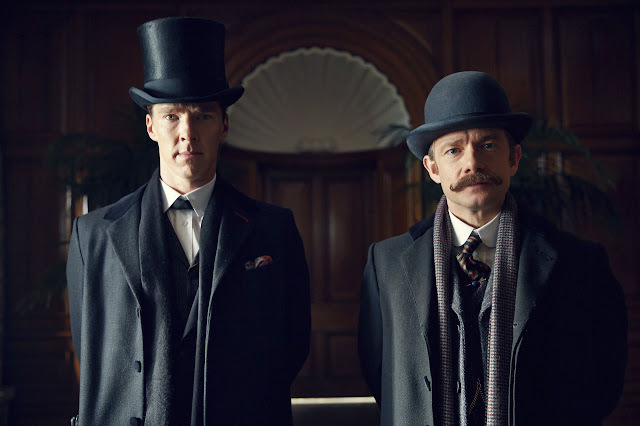 Sherlock and John never really change or grow, their relationship never develops much, and all wrong-doings are excused by Sherlock's genius or emotional damage or what have you. 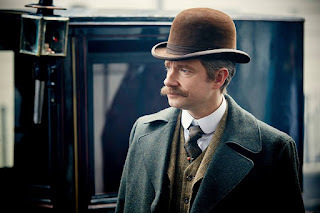 I've gone sour on Sherlock, and I'm the first to admit it. It would have been very hard for this episode to make me love it again. But I'm rather impressed that it managed to make me even more done with the show. That takes effort. My issues with this episode basically stem from how condescending it feels. I know that's a feeling and therefore not a concrete reason to dislike something, but I stand by it. The revelation that Emilia Ricoletti's ghost-ness was achieved by a "silent army" and that the agency of women is an inevitable change sweeping into England in this new Victorian age is kind of meh. It's not progressive for a show to say that women's suffrage is a good thing. I feel like we all agreed on that a hundred years ago, and even that was alarmingly late. No, the revelation that all of this was done by women isn't shocking or exciting or really anything, because like I said, once we know all of this is in Sherlock's head, there are no stakes involved. This isn't even the real solution to the murder, it's just the one he made up, which means that none of these female characters have agency. They are literally the mind projections of our male hero. And while it's nice that Sherlock's brain ascribes them all with so much agency and cleverness, especially Mary and Molly, it still feels kind of grating. It's like Moffat and Gatiss are standing there yelling, "See ladies? We get that women have to deal with a lot and have historically suffered. But it's all cool now because you can vote and this was a hundred years ago. We good? Now back to our regularly scheduled manpain!" The whole plot is eventually swept away and never mentioned, just a foundation for an episode that is much more concerned with making Sherlock an ever more tragic figure than it is with giving its female cast anything to do. 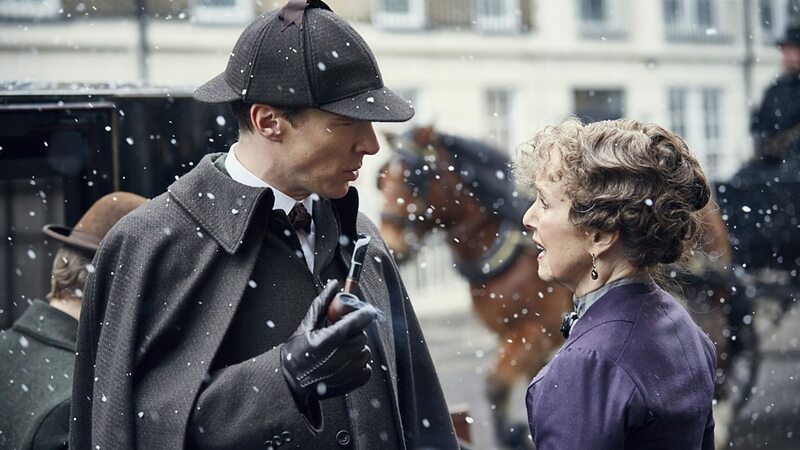 Heck, there's even a meta-point about this, where Mrs. Hudson is mad at John for writing her out of his stories (in Sherlock's mind world) and keeps yelling at him about it. The irony? She doesn't do anything in this story either. It just rubs me the wrong way. Clearly. But I can't say that I know what I would do differently if I were them. Or rather, I can't say what I can imagine them doing differently. This episode felt like a pat on the head and a "run along now," and I don't like it. More than this, though, this episode just doesn't work on a fundamental level. By trying to give us an alternate version of Sherlock while also advancing the plot of the main story in the canon universe, it achieves neither of those goals and just makes a mess. I ended up spending about fifteen minutes explaining the episode to my parents afterwards, and they'd been watching right along with me. That's not a good sign. So, no. 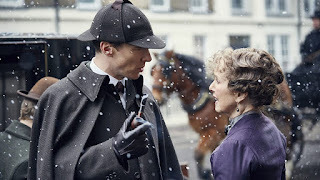 I didn't like "The Abominable Bride". Great setup, terrible payoff. And in a lot of ways that's how I feel about Sherlock as a whole. It had a great setup and an awesome takeoff, but it has completely failed to stick the landing. I would have loved a whole episode actually about Emilia, though. She was super interesting. *I have actually been there. It's lovely, but very steep. I wouldn't let my parents take my picture with the statue of Sherlock Holmes they have, so instead I have a photo I took of them sitting next to him/on his lap. Good times. **Basically, the solution is that while Emilia Ricoletti did in fact die of a gunshot to the head, she didn't die when everyone thinks she did. The first time, when she shot herself in public, was fake. She shot into the ground with one gun and then fell backwards while pretending to have shot herself in the head. Her body was switched with a double to go to the morgue, which allowed her to go after her horrible husband. After shooting him, though, Emilia, who was dying of tuberculosis, had her friends shoot her in the head for real and then replace the dummy body with hers in the morgue. Gruesome, but effective. 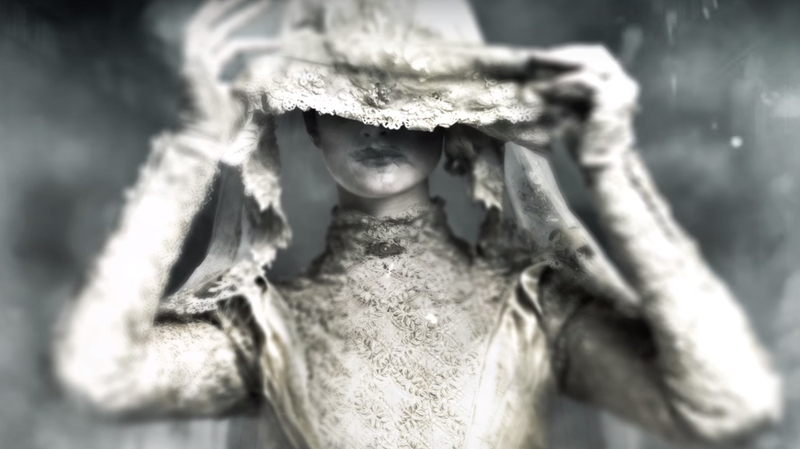 The following sightings of "the bride" were her friends dressed up as her to spread fear. Effective! And they killed Sir Eustace because he was yet another man who let Emilia Ricoletti down and had to pay for his sins. Ironically it seems he was actually killed by Lady Carmichael, who was friends with Ricoletti. Agreed. I'm not sure there were any fans who legitimately thought that Moriarty might not be dead. He was definitely dead. I didn't need an interstitial to get me there. A stand-alone period piece would have been more fun overall, especially since this mystery had the potential to be really interesting.